Nelly Mazloum was a film star in the Classic Black & White Cinema Era in the 1940’s-60’s, starting as a child prodigy in her first film was when she was 10 years old. Ms. Mazloum has a strong position in the Cairo film and theater dance history. I was not only interested in Nelly Mazloum for her position as a film star and beautiful dancer, I was also fascinated that she had done folkloric dance research and formed a folkloric dance troupe in the mid-1950’s. (Firqit Reda and Kowmeyya both were started in the 1960’s.) I was also interested in her Raqs Hawanem (the dance of the ladies) research and how she would bring this dance of secluded upper class women to the stage. As I continued researching I saw a bi-cultural woman deeply involved with the arts and entertainment in the changing times in Egypt. She was born in 1929 in Alexandria, Egypt to wealthy Italian-Greek parents, her mother being an accomplished pianist. Ballet helped her gain strength after polio affected her legs at 2 years old. Her mother became her impresario. According to Wikipedia; “from 1959 to 1964 she was the choreographer of Al Masrah al Kaoumy (National Theatre), Koumeya troupe.”³ This one area where I will continue to investigate as Al Firqah Al Kowmeyya Al Fannun Al Shaabeya did not start until the mid-1960’s. Possibly the Al Masrah al Kowmeyya (literally; “the theater the national”) is a different organization than Al Firqah Al Kowmeyya Al Fannun Al Shaabeya (literally; “the troupe the national the artists the folklore”). “Woman is the Eternal Goddess. This realization must become part of our culture. If man is the symbol of Positive power, woman remains forever the symbol of the Great Mother: she is the feminine energy which receives and reconciles, which conceives and recreates. 4 Marianna said during a lecture on Mazloum’s life and career in CID, UNESCO (International Dance Council), cited in Wikipedia. 5 For the “Journey through Egypt Dance Archive Project” I interviewed Anahita of Kiel Germany about Nelly Masloum. 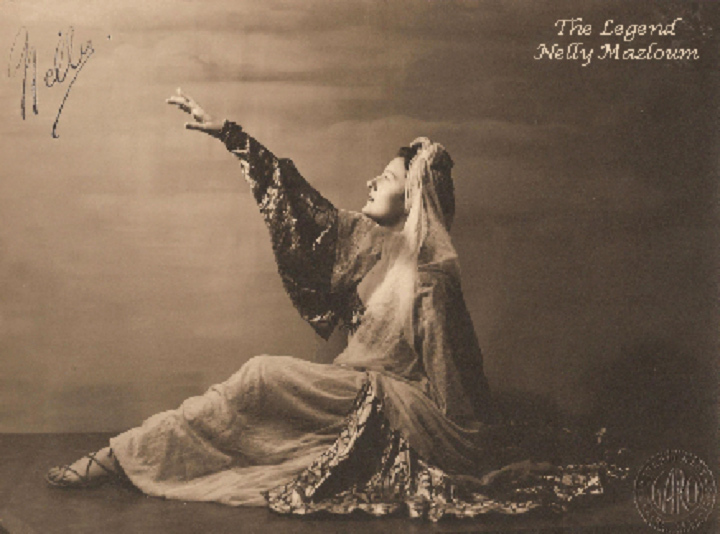 I had heard before that Nelly, who was well known as film-star in Egypt’s Black-and-White films, had started a folkloric dance company before Mahmoud Reda. As Anahita had been a loyal student of Nelly’s dance classes, and as a scientist Anahita keeps very complete notes, I asked if I could interview her. 9 Responses to Who is Nelly Mazloum? You are the ONLY teacher I met, besides my first teacher Debbie Goldman aka Amoura who speaks of Madame Nelly Mazloum. I never met Madame Nelly Mazloum in person but Debbie did and she brought me the book by Madame Nelly Mazloum, autographed for me. This book is such amazing inspiration!!! Carol lee, I loved this and brought back wonderful nostalgia. As a 5 yr old, I was introduced to a dancer named Morocco (not the current one) who mesmerized me with her dancing. The local community used to bring her in to perform and I of course tried to emulate her. After a performance, she took me under her wing and taught me a bit of moves and I performed as a 6 yr old for the local Lebanese Haflis(parties). Of course, the rest is history! Just wanted to leave a quick note of gratitude for all that you do for Egyptian dance research! I look forward to the Journey Through Egypt archive and your upcoming book! Nelly Mazloum has extremely important, insightful views on our feminine role. It’s the first time I’ve seen a teacher truly relate that gift in a dance class. This is a beautiful work about my wonderful teacher Nelly Mazloum. Wow… I absolutely love the quote you included from Nelly’s book. How important a reminder of what Danse Orientale really is- it’s something every dancer needs to remember. “Oriental Dance is a catalyst for self-made women who work hard and think straightforwardly.” This quote is especially motivational to those of us who belly dance in spite of the sideways looks we (still) receive when we tell people that we belly dance. Wonderful article about this amazing woman. Thank you so much for sharing your research. You are doing a wonderful job, congratulation. A few lines from her book: Nelly Mazloum Oriental Dance Technique (page.39) she wrote that: “Students who wish to participate in master class must become proficient in the alphabet of Oriental Dance………Following these two areas of knowledge, my methodology for a long range study includes: …..” .Nelly shared her vision with her students on Oriental Dance and Egyptian Folklore, she never mentioned Expressive Dance, she taught during her seminars 8 to 9 sequences, most, on her method of Oriental Dance and Folklore, she will include in her seminars and classes one sequences on Pharaonic dances and one on Hawanem. I always wondered why they only show my mother in the films and they never pass on the internet her TV show and theatrical folkloric work with her Arabic troupe of dancers from 1956 to 1964. They can be found in the Egyptian TV archives? I wish to also mention that who was talking about Oriental Dance before 1988, she introduced Oriental Dance to Europe the first time in Germany, and forbid anyone to say Belly Dancing.